You will be gorgeous, I can't wait to see them on you. Lets play soon! I need some Jessamyn time!! I can not wait to see you and your transformation. I LOVE the new picture of you as well on your sidebar...so beautiful and pure. Even though you and I are so different...I admire you for your strength, genuine soul, and the ability to stay true to who you are and where your path leads you. You bring so much richness and love to the lives of those whom you meet. I am blessed to call you a friend. I have missed reading you! Glad you're back in the game and have overridden some gremlins in your art and motherhood. (I didn't know you were a home-schooler until now, would love to hear more about that sometime...) Your dreads will be heavenly..
ooh! i cant wait to see em! i love finding you here, showing up and meeting with you. how was it we did not meet in AZ? HOW???? I love mama dreads. I have had them and cut them so many times. Why my noncommittal? i think that is a good thing, to have someone do them for you...i wish i was there because i am quite good at it and i would only charge you a cup of tea with a shot of whiskey. have fun! more than anything else...have fun. just dropping by from december views, and so glad I did. I love what you said about those nagging negative voices needing courage and and mindful discipline. So true. 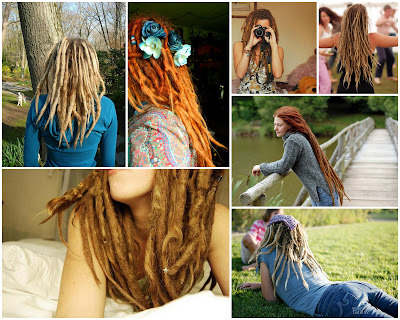 I think dreads are beautiful btw and yay for you for going for it.